Once upon a time being, forever and ever ago, there lived a forest tall of tales. When an innocent princess wanders into the forest, she finds herself trapped between a wolf with a ravenous appetite and a sweet little house with a secret. Meanwhile, a desperate fisherman enters into a very bad bargain with a power-hungry monkey. And meanerwhile still, a tiny, tricksy tailor promises a promise that not even the most magic of beanstalks can help him escape. 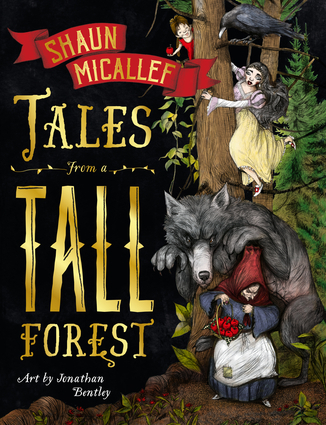 This rich and rambunctious tapestry of tales unravels the traditional fairy story and nimbly weaves your favorite characters into new and surprising adventures. Subversively silly, this trilogy will captivate parents and children alike—and indignant fairytale authors, too. More grim than Grimms', less soppy than Aesop. Shaun Micallef is an award-winning Australian comedian and actor. Jonathan Bentley has illustrated books for Margaret Wild and The Wiggles. He is the author of Where Is Bear?